Art supplies retailer redesigns e-commerce website, tapping into needs of fans voiced on social media and pays it forward. 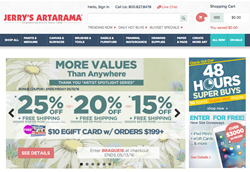 National art supplies retailer Jerry’s Artarama (http://www.JerrysArtarama.com) launched its newly redesigned e-commerce website last week. The website boasts new and improved features designed to meet the online shopping needs of artists and was inspired by the brand’s loyal and active customer base on social media. Some of the changes voiced on social media are reflected in the website’s improved functionality. These changes include the faster, easier checkout process and seamless interface, which allows artists to start building their shopping cart on one device and conclude on another. However, other changes to the website go beyond site functionality to address the cultural needs of the artists that Jerry’s Artarama serves. Additional changes include free shipping on top brands, 2,000 new and free art lesson videos, and short product videos that let artists see, as opposed to just read, about a product’s attributes and capabilities. “We know that cost remains an extremely important part of the purchasing decision for artists but trying new products are also important and inspirational. These videos are a way for our customers to better educate themselves as they investigate the products they need or may want to try for their next project.,” added Marchetta. Peer-to-peer purchase sharing ranks as one of the most important changes to the new website. Now, artists can see what other artists are buying, liking and trying on the social media trending wall, which can help them identify paints, pastels and other products that may fit their needs. As an added benefit, purchase sharing also allows artists to financially empower other artists. Customers who share that they’ve purchased at JerrysArtarama.com via social media following a completed transaction will have a portion of their purchase amount donated to the Jerry Goldstein Foundation, which supports artists, art departments and art schools. For more information and to try out the new site, visit JerrysArtarama.com. To celebrate the new site, Jerry’s Artarama is giving away $3,000 in giveaways like an iPad Mini and e-gift cards. Jerry’s Artarama is a national retailer of arts materials and supplies headquartered in Raleigh, N.C. with 16 brick and mortar locations throughout the United States and an online store. Since the first location opened in Long Island, N.Y. in 1968, Jerry’s Artarama has endeavored to offer the best quality art supplies at the best discount possible. In addition, Jerry’s Artarama serves as an artistic resource offering instructional workshops and demos and sponsoring art-related events throughout the United States. Each year, Jerry’s Artarama hosts the Art of the Carolinas Tradeshow, an annual event held in Raleigh, N.C. For more information on Jerry’s Artarama visit http://www.jerrysartarama.com.